I baked this pie on Pi(e) Day, March 14th. Unfortunately being a grad student, as it turns out, means that sometimes you lose track of time and space and pretty soon three months go by before you get around to finally getting that Pi Day post up on the ol’ weblog. The really fun thing about this pie (or tart, technically, I suppose – potato, potahto, right?) is that it involves a math activity. The recipe asks you to arrange the potato slices in concentric circles, which begs the very important question: Do I start from the outside and go in, or start from the inside and go out? If only these were the toughest questions we ever had to face in life. Trivial as it may seem, it can actually make a really big difference. Well, according to my very smart and mathematically inclined roommate, that is. The final product did turn out handsomely (what store-bought crust? Who? Me? Okay fine, but it was just this once I swear), so I think there may be something to my roommate’s theory of starting from the inside and moving outward from there. Pretty deep. Right, so, happy Pi(e) Day plus three months! Preheat oven to 350°F. In a medium saucepan, cover potato slices with water by two inches. Simmer, uncovered, until tender, about 10 minutes. Drain. If the potatoes don’t seem very dry, pat them dry with towels. Arrange potato slices, overlapping slightly, in concentric circles around the tart pan. Sprinkle blue cheese over potatoes. Whisk cream and egg yolk together and pour into tart shell, then sprinkle tart with herbs of your choice and salt. Bake tart on a baking sheet until bubbling and golden brown, about 45 to 50 minutes. Cool in pan on rack and serve warm or cold. In a large bowl, combine the flour, cornstarch and salt. Cut the butter in with a pastry blender (or in a food processor), fork or two knives until it is in very tiny bits. Add one egg and mix with a fork until a dough forms. If this does not happen easily, toss it out onto a counter and knead it together. On a lightly floured surface, roll the dough out to a 12-inch circle. Place the dough in a 9-inch pie plate or tart pan and press to remove any air bubbles. Level the edges, and refrigerate for 30 minutes. No parbaking required. 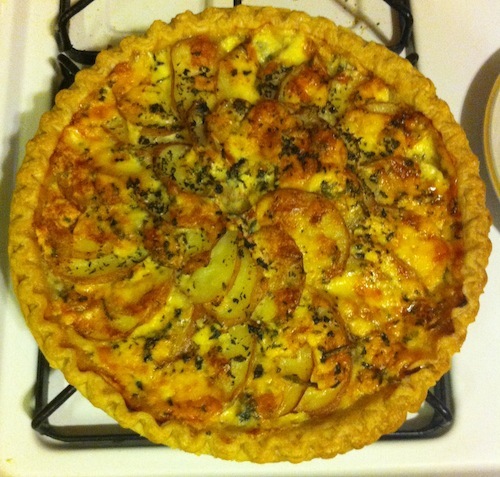 This entry was posted in Pie and tagged blue cheese, pi day, red potato, rosemary, savory, tart, thyme. Bookmark the permalink.